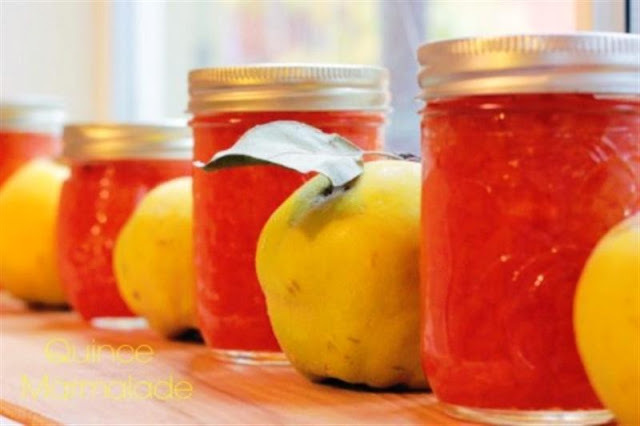 Quince preserve is one of the most prepared in Macedonia. Quinces are autumn fruit which grows in almost every house's yard. They smell beautiful, but they are too hard to be eaten raw, that's why quinces are mainly eaten as processed fruits. Quince is a fruit that is ripen from late October to December and has a real composition of useful substances. This fruit originates in southwest Asia and in ancient times was considered a symbol of fertility and a symbol of love and happiness. Apart from the minimum amount of calories and fat, it is rich in protein, carbohydrates, dietary fiber, and contains much tannin and pectin substances. It mostly contains vitamin C, and carotene (provitamin A), vitamin B1 and B2, and niacin. It's rich in copper, potassium, calcium, magnesium, sodium, iron, sulfur and chlorine. Quince seeds contain up to 15 percent oil and vitamin B17, which has anticancer action. Quince seeds are rich in fat, tannin, pectin, sugar, malic acid, emulsion and protides. 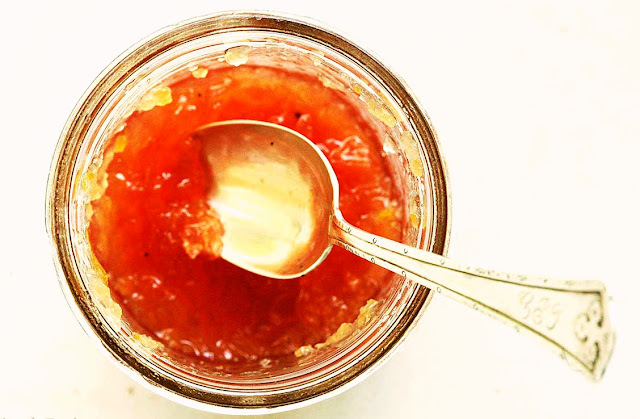 Because of this, quince is a very healthy fruit. Even the leaves and seeds are healthy, especially the fruit juice and syrup. Thanks to tannin and mucus, it has favorable effect on bowel performance and prevents infectious diseases. Quince should be used as a drug or as auxiliary cure when it comes to the following diseases and symptoms: acne, anemia, diseases of the nose and throat (tonsils), bronchitis, cramps in the stomach, flu and colds, diarrhea, eczema, bad breath, skin infections, weak immunity, cough, nervousness, insomnia, burns, stomach problems and digestive system, problems with skin diseases, various infections, inflammation of the respiratory organs, accelerates wound healing. Therefore we are advised to include quince in our diet or to use quince products, especially to use it as a dietary supplement for children. Naturally, it's the best to consume it fresh which is the only way your body can enter all the vitamins which it contains. Put sugar and 2-3 glasses of water to boil. It should become thicker, almost as syrup. In the meantime wash well quinces. Remove the seeds and the hard part around seeds. Grate them on a grater or blend in a blender crushed. Add grated quinces in the boiling syrup. Add 1 sliced lemon or orange ​​and cook for about 25-30 minutes or until sweet achieves needed density. Before the end, add 1 packet citric acid (limontus). Collect in hot jars, close and store.